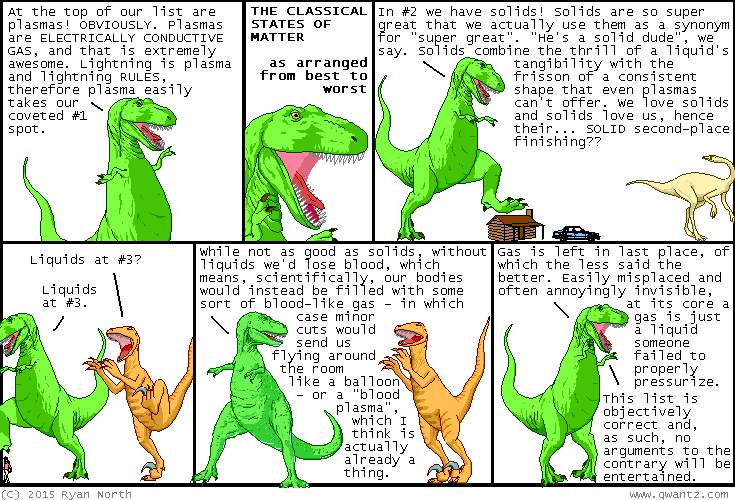 Dinosaur Comics - December 14th, 2015 - awesome fun times! December 14th, 2015: Here is a comic I wrote using my hands AND brain!! Also a computer. What are you doing this Thursday night? I sure hope it involves coming to The Fifth-Ever Beguiling, Dinosaur Comics, Squirrel Girl, Jughead, Kaptara, A Softer World Holiday Party 2015!! It's at Pauper's Pub in Toronto, it features AWESOME PALS, and there'll be a Secret Santa exchange. You should come! Click here to read more, and here is the Facebook event! One year ago today: oh also we're going to need video footage of every agent in a sauna and not wearing a hat, silk or otherwise. you understand.